The Xtreme Transistors Group investigates novel transistor architectures based on new materials with the goal of expanding the frontiers of electronics to reach higher frequencies, higher speed, smaller size, extremely low power consumption, higher operating temperature, or to switch electrical power or amplify electrical signals at higher power levels. We have a particular interest on the potential of III-V and III-N compound semiconductors for new applications. Our research is eminently experimental. 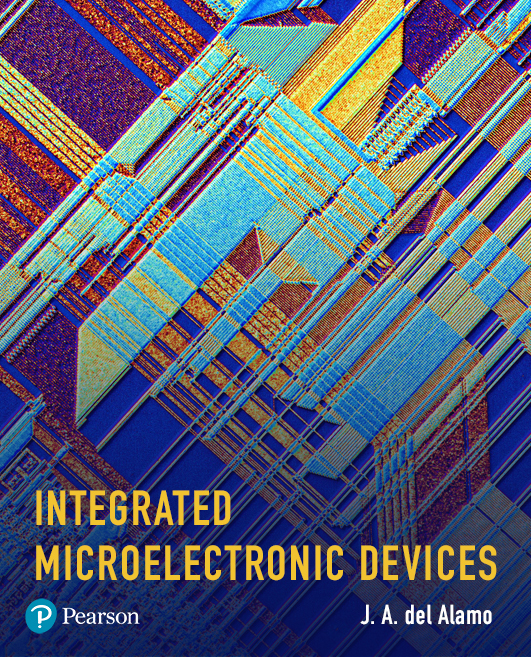 We design and fabricate our own prototype transistors at the facilities of the Microsystems Technology Laboratories at MIT. We then characterize their operation in our own measurement laboratory. We also study the reliability of transistors under prolonged electrical, thermal and environmental stress. We build models and carry out simulations in order to understand the underlying physics. All our research is performed in close connection with industrial partners. The iLab Project investigates the technology and pedagogy of online laboratories ("iLabs") for science and engineering education. iLabs are real experimental facilities that can be accessed through the internet from a regular web browser. 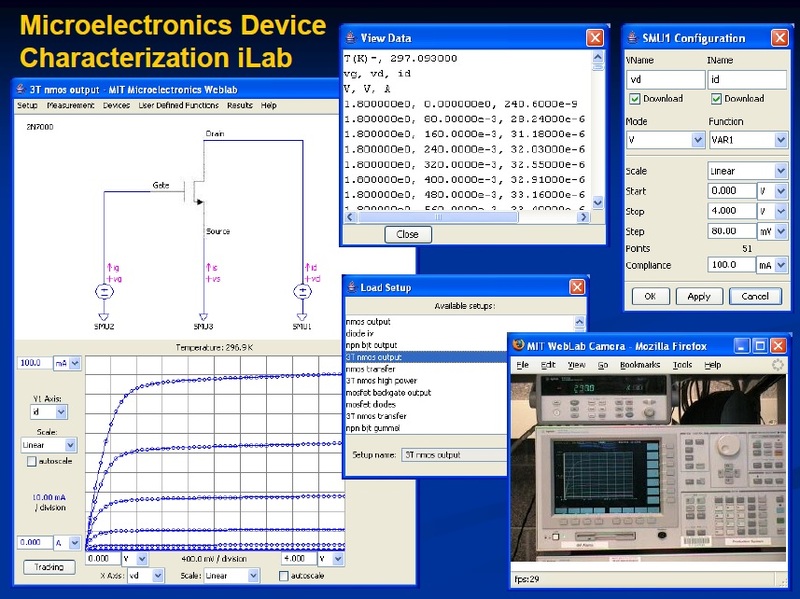 This project has developed several iLabs for electrical engineering education. These have been used by thousands of students from around the world to carry out assignments in courses in electronic circuits and microelectronic devices. The iLab Project has also created the MIT iLab Architecture, an open-source toolkit of reusable modules and a set of standardized protocols to facilitate the rapid development and effective managements of iLabs on a worldwide scale. In collaboration with three Sub-Saharan universities, the MIT iLab team has been exploring the unique potential of iLabs in developing countries. 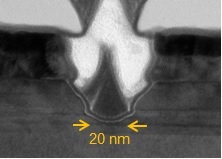 Cross section of a self-aligned InGaAs Quantum-Well MOSFET with a gate length of 20 nm. 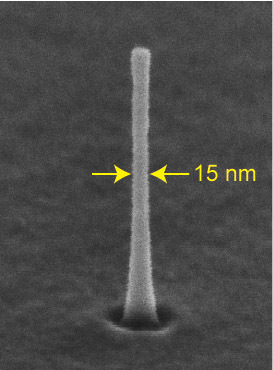 This is one of the smallest III-V MOSFETs ever fabricated (research of Jerome Lim). Learn more here. 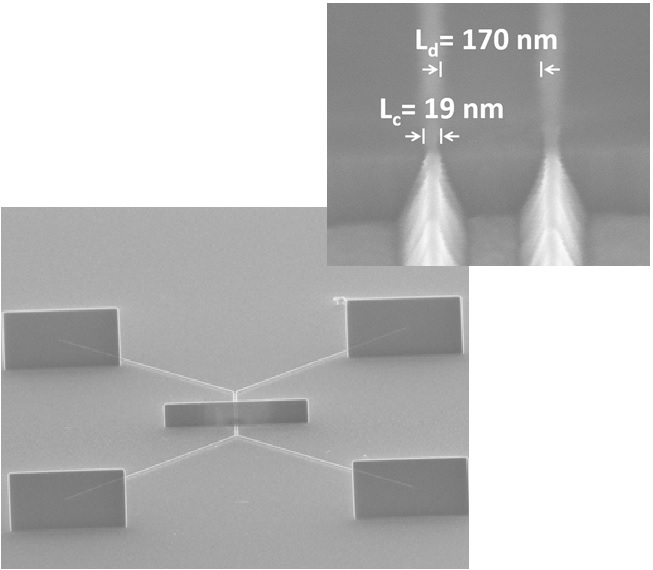 Planar view of a nano-transmission line model test structure to measure the contact resistance of nanoscale III-V contacts. 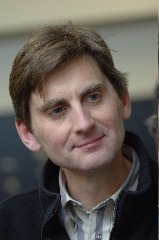 The inset shows two contacts 19 nm in length and 170 nm apart (research of Wenjie Lu). Learn more here.